Two-thirds of adults online use social media like Facebook, Twitter, MySpace and LinkedIn, primarily to maintain connections to friends and family, according to the results of a survey by the Pew Internet and American Life Project. Of the more than 2,200 participants in the survey, 67 percent said the major reason they use social networks is to stay in touch with current friends, 64 percent to stay in touch with family members and 50 percent to connect with old friends they had lost touch with. 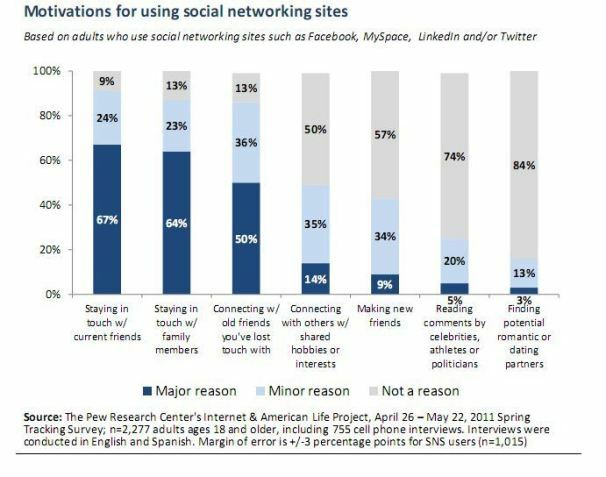 Other major reasons for joining a social network were connecting to others with shared hobbies or interests (14 percent), making new friends (9 percent), reading comments by celebrities, athletes or politicians (5 percent) and finding potential romantic or dating partners (3 percent). Women were more likely than men to cite keeping in touch with family as a major reason for joining a social network, the researchers found, with 72 percent of women giving that reason, compared with 55 percent of men. Researchers also discovered that survey participants under the age of 50 were more likely to cite staying in touch with current friends (more than 70 percent) and connecting with old friends (more than 53 percent) as a major reason for joining a social network. 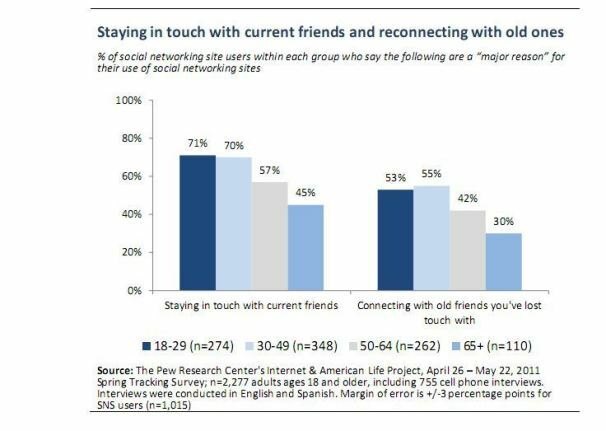 According to Pew, looking for new friends is not a major consideration among most social networkers. Only 9 percent chose it as a major reason for using social networks, and 57 percent said it wasn't a consideration at all. However, certain groups of respondents placed a higher value on finding new buddies than others. Fourteen percent of men, for example, put it on their list of major reasons. More African-Americans (15 percent) and participants with a high school diploma and no college degree (16 percent) gave it greater value than the survey sample as a whole. Middle-aged adults are more interested in using social networks for hobbies and interests than other age groups, the report said, with 16 percent of 30- to 49-year-olds and 18 percent of 50- to 64-year-olds picking that as a major reason for joining a social network. While connecting with public figures and celebrities didn't garner many responses as a major reason for joining a social network, some ethnic groups, African-Americans (10 percent) and Latinos (11 percent), did cite it as a major reason for using a social network. That compares to 3 percent for whites, the researchers found.